Falls off ladders are a surprisingly common injury in our community, and whilst most amount to nothing more than dented pride when they occur, some are considerably more serious – just ask Mr Ian (Molly) Meldrum. Recently we had cause to treat yet another considerably more serious “ladder injury”. A 56 year old man had been painting his ceilings at home when he fell off his ladder. Whilst this may read as any other 6 foot step ladder incident, this particular event was made all that more serious by the fact that the ladder was perched precariously on the kitchen bench at the time. The patient had actually managed to paint a considerable portion of the ceiling, but in attempting to stretch for that extra few centimeters, over balanced the ladder which proceeded to topple out from underneath him. He struck his head on the stone bench top on the way down and sustained a hyperextension injury to his neck. His presenting neurology was of elbow extension weakness of the right arm in the setting of severe neck and arm pain. 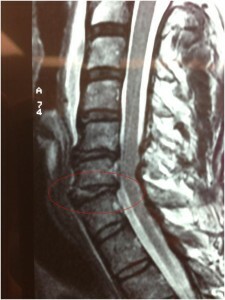 Pre-operative MRI (see image above) showed evidence of disc disruption at the C5/6 and C6/7 levels with considerable nerve root compromise at each of these levels. At operation the C6/7 was grossly disrupted and gaped open whilst the C5/6 was less affected. 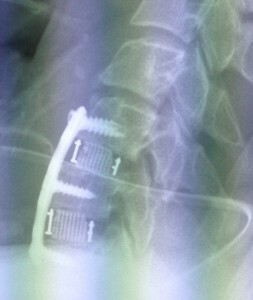 A two level discectomy and fusion was undertaken (see right image) and fortunately the patient was able to be discharged without any persisting neurology 4 days later.